Eliza’s House is a small frame building named for Eliza Leach (1891-1986), who worked at Middleton Place for more than 40 years and was the last person to live in the house, and is one of several structures on the grounds that interprets African American life. 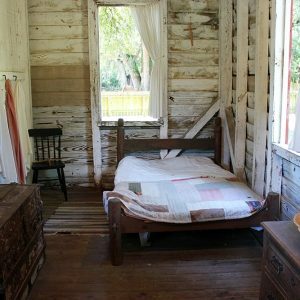 The original occupants of the house are not known, but in the 1880s it was apparently the home of Ned and Chloe, former slaves of Williams and Susan Middleton, who worked on Middleton Place. The plantation chapel, a room above a spring houses dairy, was used by slaves as a house of worship. Middleton Place recently produced a documentary film of life on the plantation before and after the Civil War, called “Beyond the Fields – Slavery at Middleton Place.” While the film is available on BluRay disc at Middleton Place’s gift shop, you can see the trailer for the documentary here.